By Cha Holland. Played using Firefox. All in-game imaginary alchemical systems suffer the problem of needing to teach the details “from scratch” — assumptions from the real world do not apply. I’ve generally seen this solved with a recipe manual (given slowly or all at once), so that the player gets some starter recipes and is able to extract some sense about what the bluespan and the whirlbowheel and the whitegrass do in a logical way. There’s still a feel of experiment and the necessity of failure, but at least there’s no rudderless flailing about. 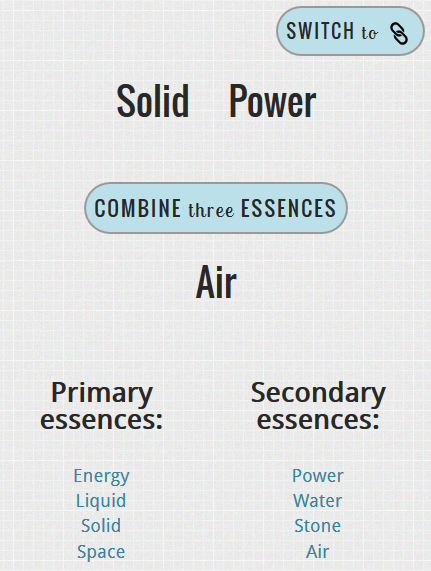 Growbotics is entirely composed of an imaginary system for combining “essences”. There is, as far as I can tell, not enough of a system for a player to work with, so they’re forced into a random clicking method. As PROFESSOR G you keep the world safe for science, with special powers including particle acceleration and chromatography. although I’m pretty sure I hadn’t earned it, because I was clicking just as randomly as before. I did love the presentation and graphics and sound, and I’m not against games playing more like experimental toys, but my experience with GROWBOTICS was so random I just didn’t have fun with it. This is spam so I took out the link, but the verse is crazynuts so I kept it in.